BRIMSTONE is a beautifully photographed and designed western thriller that features Dakota Fanning and Guy Pearce in fiercely committed performances. However, it falls into the trap of seeking to portray and condemn sexual violence against women by basically showing us a lot of sexual violence against women, in such a manner and style that it almost seems to be enjoying it. The result is a film that looks beautiful and is certainly fiercely focussed on what it wants to achieve, but which jumps the shark at several key moments, and left me wondering whether it was good with occasional misjudgments, or just plain objectionable. 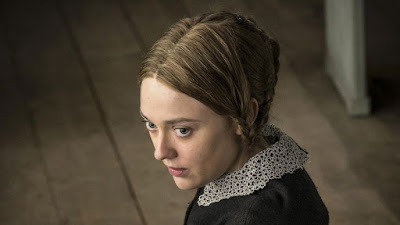 The film is set in the American midwest in the mid 1800s and focusses on a young mute woman (Dakota Fanning) who is a wife and mother to two small children. In the first of four chapters we see her incite the vengeance of a mean-spiritied judgmental preacher (Guy Pearce) out of all proportion to her apparent crime of having chosen to save a mother over her baby in a troubled delivery. But still, in this chapter I was convinced this film was going to be a well-acted, tense, taut thriller. That is until a final act of violence so absurd it pulled me out of the film. But that was ok, because we then moved into the second chapter, and an apparent re-set of the film, as we met a young runaway girl being picked up by Chinese travellers and sold to a brothel keeper. This was by far the most interesting and successful segment of the film but once again utterly jumped the shark with violence by the end. And it was notable that at both of these points in the film, a number of people walked out. Bu the film got really problematic in its third and fourth segment, where the true nature of the relationship between the preacher and the girl is revealed in all its melodramatic, exploitative detail. What can I say? If this movie had just exercised a little restraint and thought deeply about how to depict violence against women it might have been a really fascinating, genre-bending movie. But the director, Martin Koolhoven, seems to have zero instinct about what's provocative and what's just offensive. It's an enormous shame because Guy Pearce and Dakota Fanning are clearly going for something high quality here, but there's let down by a director with a tin ear. BRIMSTONE is rated R and has a running time of 148 minutes. BRIMSTONE played Venice, London and Toronto 2016. It does not yet have a commercial release date.